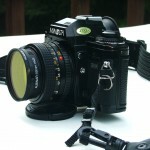 This is really the one that got me started down the path of photography, and it’s still my main camera, the one I feel most comfortable with and which I can always count on. It’s not even really mine, it’s my dad’s, but he hardly used it so he loaned it to me years ago and I’ve been using it ever since. 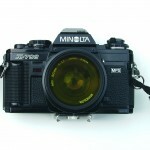 The X-700 is a manual-focus SLR which has a Minolta MD lens mount, which can be used with MD (automatic-capable) lenses or the older MC (manual mode only) lenses. 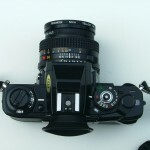 The camera can be used in program mode, aperture-priority, or manual mode. This camera has been everywhere with me, on road trips across the country and to the tops of mountains on hikes and on long bike rides. It’s got some dings and wear and tear, but it’s still the one I reach for first. 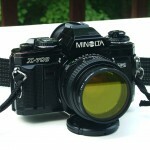 Shown here is the Minolta 50mm lens that came with the camera, and yellow contrast filter I usually have on it. This is probably my best lens; in my experience Minolta factory gear is outstanding and generally better quality than third-party gear.